The special representative of the Secretary-General and head of the United Nations Regional Office for Central Africa (UNOCA), François Louncény Fall, appeared before the UN Security Council in June to brief it on the situation in the Central African region. Africa Renewal: Two issues seem to define the current situation in the Central African region: terror-related violence and contested elections. Isn't that a worrying trend? Mr. Fall: Certainly! 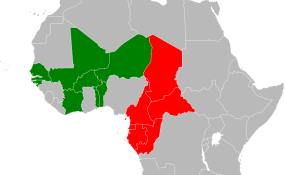 The Central African region stands out for various reasons. Firstly, the Economic Community of Central African States (ECCAS) has been unable to effectively play its role as mediator, although it is being reformed. Secondly, almost all of the elections in the region, or at least seven of them held within the last year, were marred by controversies. This led to multiple problems that we are now dealing with. With some of the countries now getting ready to elect their members of parliament, we will have a lot to deal with. Now if you add to that the Anglophone protests in Cameroon, the armed insurgency in the Pool region of the Republic of the Congo and other internal issues in other countries, obviously the situation in the Central African region is of concern. In addition, the economic situation is also worrying. The fall in commodities and oil prices has hit the region hard. Is Chad, an oil producer, one of the countries affected? Not just Chad, but the Congo and Gabon as well. Last year, members of the Central African Economic and Monetary Community (CEMAC) agreed to work with the International Monetary Fund (IMF) to shore up their economies. Chad and Gabon appear to be doing better, but the region overall is going through a hard time. So when you add the impact Boko Haram activities are having in Cameroon and Chad, it becomes clear that Central Africa faces great challenges. How is it that all of those issues seem to be happening at the same time? This could be explained by the fact that there really have not been political changes in the region, as elections remain controversial and the economies are weak--this can lead to all sorts of problems. You said almost all elections in the region are marred by controversies. Why is that? I believe that every country in the region has to do better. They have to ensure that those who are tasked with organising elections do their job and that the voting process is transparent. In the past, we have had elections that were widely contested, but progress is being made in the Congo and in Gabon, as opposition parties and the government are talking to each other. In general, we have always advised opposition parties never to spurn a chance to talk to their governments. Dialogue offers a chance to reform the electoral process, but nothing will change if opposition parties refuse to take part in discussions. I believe that every country in the region has to do better. They have to ensure the voting process is transparent. Beyond advising opposing parties on the need for dialogue around elections, how is the UN office in Central Africa involved with efforts to end conflict in the region? We offer our good offices and our expertise. We also work towards strengthening ECCAS mediation capacities in each of its member countries, especially with women's organizations, youth associations and other civil society groups. Going back to security, there is the issue of the persistence of the Lord's Resistance Army (LRA) in northern Uganda and its implication for the region. Until recently there was international military cooperation, and now we are hearing that the coalition may be falling apart. The US has left and some countries are withdrawing their troops. How did we get there? We expressed to the Security Council our great concern about the vacuum left by the departure of the Ugandan troops and the American Special Forces from some areas in the Central African Republic. That vacuum may attract other armed groups and undermine peace efforts. We have suggested to the Council that they look into the possibility of deploying the UN Multidimensional Integrated Stabilization Mission in the Central African Republic (MINUSCA) troops to fill the vacuum while working to strengthen the Central African Republican army's abilities to take over at a later stage. It's possible, because everybody knows and understands that there is a real risk, that there is a real threat for peace and security in this region. Since the American Special Forces left, Uganda's troops and other allies are leaving as well. Why? I believe Uganda forces are leaving because the LRA may no longer be a threat to the Ugandan government. That may be true, but we are saying that the LRA is still active and is committing violence against women and attacking civilians. Even if the LRA is no longer a threat to the government of Uganda, it remains a threat to peace and the stability of the region nonetheless. How soon do you think the vacuum left by the withdrawing troops could be filled? We are working actively with MINUSCA to fill the vacuum as soon as possible. I have been assured that the force commander is working on that. Could armed groups take advantage of this vacuum? There are several other armed groups, not just LRA, in the region that borders the three countries: the Democratic Republic of Congo, South Sudan and the Central African Republic. Unfortunately, none of these governments control the area. So when there are no effective authorities, rebel groups from any of the three countries could move in. What would be your assessment of the work that the UN is doing in the region in general? It is great work overall. Take the elections, for instance. Even when I mentioned earlier that elections in the region generate a lot of problems, we also are working closely with all the political parties to avoid violence. We are working to strengthen the capacity of ECCAS in terms of preventive diplomacy. As you know, the sub-region has a role to play in maintaining peace and security among its members, so we are working with the regional organization to sustain their capacities. Copyright © 2017 Africa Renewal. All rights reserved. Distributed by AllAfrica Global Media (allAfrica.com). To contact the copyright holder directly for corrections — or for permission to republish or make other authorized use of this material, click here.